Picross e is Nintendo doing a very good job of teasing me and the scores of other picross fans out there. Released on the 3DS eShop (explaining the lowercase “e” in the title) just over a week ago, Picross e is easy bait for us picross fans. It’s only $6, and having a digital Picross game on my 3DS is like a most wonderful dream come true. It’s even more appealing than DSiWare’s Brain Age Express: Sudoku. There are two things I need to get out of the way before I talk about the game proper, and the first of those is that I am an absolute picross maniac. This is very important for you to know, so that you can balance this review against my unstoppable bias. I love picross, and have spent many,many hours playing the various Nintendo-produced picross video games into the ground It is my first true love, and the one truism you can apply to me is that I will always buy the new picross game. 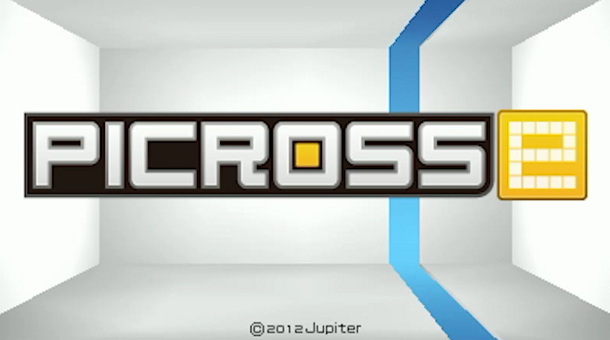 The second thing you should probably know is what exactly a picross is. Picross is a puzzle game where you’ve got a grid of squares with a bunch of numbers around the edge, and your goal is to chisel out the correct squares to make a picture. The numbers are indicative of how many target squares are in each row and column, but don’t say exactly where they are. So you have to use the powers of logic to deduce which squares you need to chisel. I’ve probably explained this somewhere on this website before, but it’s probably best to make sure; picross isn’t nearly as ubiquitous as it should be. Now that the scene is set, let’s talk about Picross e specifically. Immediately it comes off as a sort of Picross DS Lite. The overall style and presentation are similar, but there is considerably less flavour. Picross e doesn’t have any fancy music options, or visual themes for you to choose from. In fact, the only significant choices you have to make are whether you’d rather use the buttons or touch screen, and if you want hints on or off. It’s very to-the-point, and doesn’t concern itself with a lot of the pizzazz its big brother had. That said, one of the most grievous missed opportunities in Picross e, as far as I’m concerned, is a lack of puzzle themes. There are four to choose from: Easy, Normal, Free, and Extra. None of these have any themed sets within; they’re all just random puzzles thrown together. That’s really not a big deal when you just want to get your picross on, but it’s a nice flavour that most of Nintendo’s other picross games feature. Even the mostly-crappy Color Cross has themed puzzle sets. Oh well. There aren’t any Nintendo-themed puzzles either, but I’ll let that one slide. The real problem lies is the lack of, well, puzzles. Picross e boasts somewhere around 150 puzzles, and while that sounds okay -and really it is for the average person- that’s like one evening worth of game to a picromaniac like myself. The low price tag helps soothe the burn, but I’d just as soon pay a little more for a larger selection of puzzles. Not to mention that the puzzle grids in Picross e only go up to a measly 15×15 size, which is pretty much cake even for the hardest puzzles. It’s not bad, but I need at least one page of beeefy 20x25s for maximum enjoyment. The game is split down the middle as far as distribution of puzzle modes go. 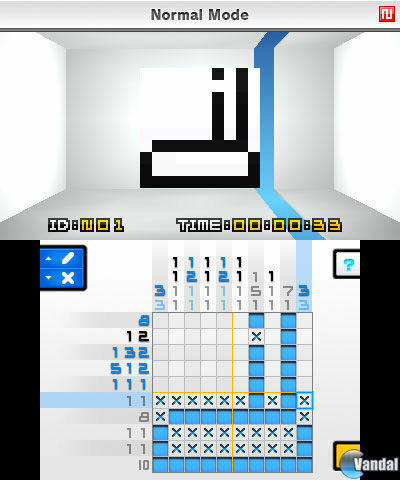 Easy and Normal are regular picross, where if you chisel a wrong block, you take a time penalty and move on. Free and Extra modes are free picross, where if you chisel a wrong block nothing happens and it’s up to you to figure out if you’ve made a mistake. While it makes sense that the game would have an even amount of both types, the fact of the matter is that here, regular puzzles only have a timer to see how long you did, and the penalty is just adding some minutes on. It’s totally boring, because regular picross is only fun when the timer is a countdown and if too many mistakes you lose. It’snice for beginners, but the total lack of consequences for stupidity is something I find off-putting. The Free and Extra puzzles are pretty great though, and a lot of them are actually pretty tricky! None that are outright difficult, but I’ll admit that there are a few that took me over 10 minutes to solve. Solving the puzzles will have to be its own reward too, because Picross e doesn’t really celebrate your victories. Whereas past games have rewarded you at certain intervals with prizes ranging from gold stars to new sets of puzzles, Picross e does no such thing. Not even a cheery “you did all of these, yay!” message after completing any of the four modes. The only congratulation you get is once you’ve solved all the puzzles, and it’s a picture of a small gold medal with some text saying something along the lines of “Good job. Keep enjoying picross!” It’s another tiny gripe, but it’s weird for so much flavour to be absent when Jupiter traditionally smothers their picross games in that kind of stuff. Picross e features the usual hint system, which will reveal one column and one row when you start a puzzle, but only halfway through Free Mode did I notice that there’s actually a second, much more subtle, hint system in this game. What it does is the game highlights the numbers of any row or column where you can make an absolute move. It doesn’t tell you which kind of move it is, or give you any idea how to figure out the move, but it gives you a place to start looking. Whether you can actually figure it out from there is a totally different matter. Because I love picross, I made sure to turn this feature off as soon as I noticed it, but I think it’s a pretty brilliant way to give the player a hint without outright spoiling the challenge. I’m a little bit disappointed that there aren’t any extra features, like downloadable puzzles or a puzzle creator that lets you make and share puzzles with other players, but I suppose that you get what you pay for. It doesn’t have to be as robust as Picross DS, but maybe a little something to keep me interested would be nice. Overall, I did have a great time with Picross e, but the fact of the matter is that it really just left me wanting more. Picross DS was stuffed to the brim with puzzles, and by the time I’d cleared them all I was actually picrossed out for a while. Picross e just makes me wish Picross e2 was already available. It’s probably my fault for burning through it so quickly, but it was also pretty easy, so I’m going to say the blame is 50/50. So I’ll hang up my picross shoes for now, and settle into something else until that Picross e2 does show up. Then I’ll complain about that one being too short too, and hope that Picross e3 is better, and the cycle will continue forever. Trivia: The word “picross” appears forty-one times in this article, including that one and the title image.